According to ChemOrbis, several cracker restarts across Europe are seen weighing down the monomer markets in the region. Both spot propylene and ethylene prices lost ground during this past week in spite of the weekly gain in spot naphtha costs. Spot propylene prices declined by €20/ton at the end of last week, maintaining their gradual decreases since the beginning of June due to improved supply in the region in line with the return of crackers. 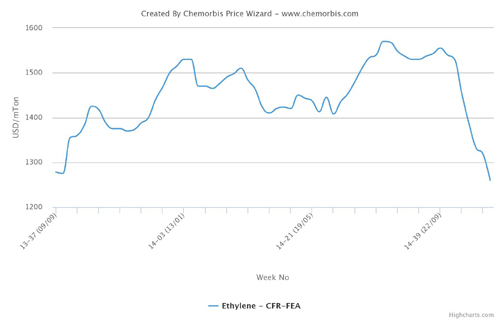 For ethylene, spot prices also posted weekly decreases of €25/ton after tracking a stable trend in the previous week, according to players. 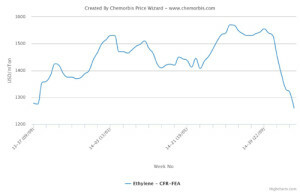 Despite cracker restarts, tightness for ethylene is yet to ease in the region, according to ChemOrbis. Some crackers have already returned from shutdowns while more restarts are planned for the June-July period. Repsol restarted their cracker at Tarragona, Spain in the first week of June following an unplanned shutdown on May 20. However, the company is yet to lift the force majeure on ethylene from the 700,000 tons/year cracker. Market sources reported that TVK also restarted their Olefin-2 cracker in Tiszaujvaros, Hungary last week. The cracker has a capacity to produce 250,000 tons/year of ethylene and 125,000 tons/year of propylene. BP Refining & Petrochemicals is expected to restart their Olefins-3 steam cracker in Gelsenkirchen, Germany by the end of this week. The cracker was shut due to technical issues in the second half of May. Total and Ineos’ joint venture Naphtachimie cracker in Lavera, France is undergoing repair works and it is scheduled to resume operations in the last week of June. The cracker, which has an ethylene capacity of 775,000 tons/year, was shut following a fire on May 17. Versalis is also expected to restart their Brindisi steam cracker in Italy by the end of June following a planned turnaround. Sources added that Shell is expected to reach on-spec production at their 900,000 tons/year steam cracker in Moerdijk, the Netherlands in the first half of July following a prolonged shutdown that started in October, 2014.